The MMR vaccine is a vaccine that protects against measles, mumps and rubella viruses. The MMR vaccine is recommended for children and some adults, and most states require proof that a child has had a MMR vaccine before they can start school. While the MMR vaccine is common, finding where to get one can be a challenge, especially if you need a clinic that is open odd hours. Next time you find yourself asking, “Where can I get a MMR vaccine?” Remember FastMed. Measles, mumps and rubella: What are they? Measles (also known as rubeola) is a respiratory disease that is highly contagious and can cause fever, cough, runny nose and rash. Mumps is a contagious disease that causes headache, fever, muscle aches, tiredness and the swelling of salivary glands. In recent years, mumps has become rare in the United States due to the MMR vaccine. Despite their similarities, rubella is not the same as measles. While rubella is caused by a different virus, both viruses cause a red rash. 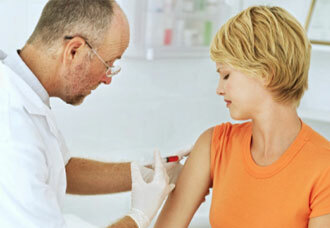 Typically, the symptoms of rubella are milder than those of measles. Who should get a MMR vaccine? The CDC recommends that children get two MMR vaccines: one between 12 and 15 months, and another between 4 and 6 years. Who should avoid a MMR vaccine? Are there side effects associated with the MMR vaccine? Side effects are uncommon, but can include soreness where the shot was administered, a low fever, or swelling of the cheeks. These side effects should go away on their own after a couple days. FastMed Urgent Care is open 7 days a week. No appointment is needed and we accept most major insurance companies. Need compassionate and affordable care ASAP? Check in online!